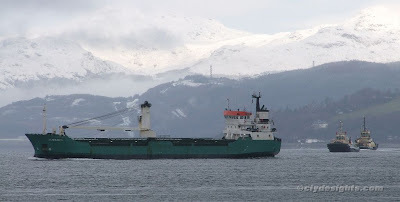 It's unusual to see a geared ship heading to Sandbank to load timber, but today saw the Holy Loch Marina's berth receiving a visit from ALHOLMEN, a Finnish coaster built in 1984 as MANGEN for German owners. ALHOLMEN is now owned by Kraftline, and is 3,175 tonnes deadweight with an overall length of 86.95 metres. She was built by Nieuwe Noord Nederlandse Scheepswerven BV, at Groningen in the Netherlands. ALHOLMEN sailed this afternoon, having loaded just a part cargo. Weather conditions had made it impossible to deliver more timber for shipment, and she will instead complete her loading at Kyle of Lochalsh.